As the last one in the batch I made for my little relatives, this Chocolate Butter Cookies came out very well. While it was getting baked, it smelled so much like a delicious cake and tasted so much like that too. 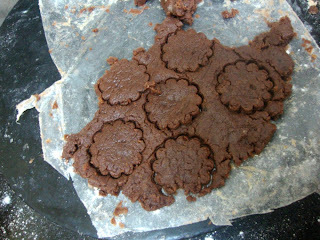 I was so trilled baking these as these tasted much like brownie yet was crispy. Finally this scored the best as Chinnu loved this. I had planned on making a brownie for the event but couldn't make it. Yet I have been really satisfied with the dishes I was alble to squeeze in. Hope you guys enjoyed. These cookies still look very gooey but when you allow it to cool it for a while, they turn out very crispy. The dough will look soft and gooey to touch. Press out on a sheet and use a cutter to cut out a shape as desired. 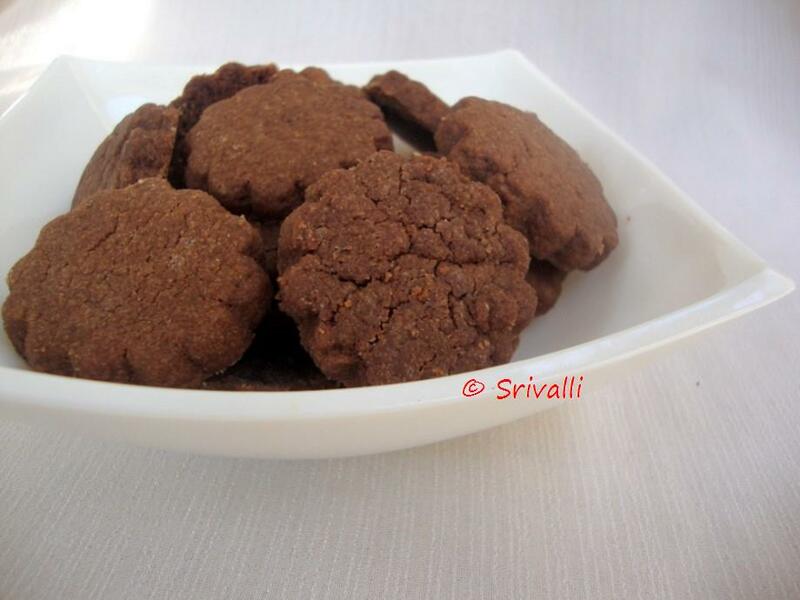 Chocolate Butter Cookies in Microwave Convection Oven. 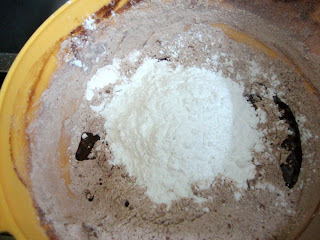 In a bowl, shift the flour with icing sugar well. Add the vanilla essence and mix. Then add the cocoa powder, combine everything. Melt the vanaspati, butter. 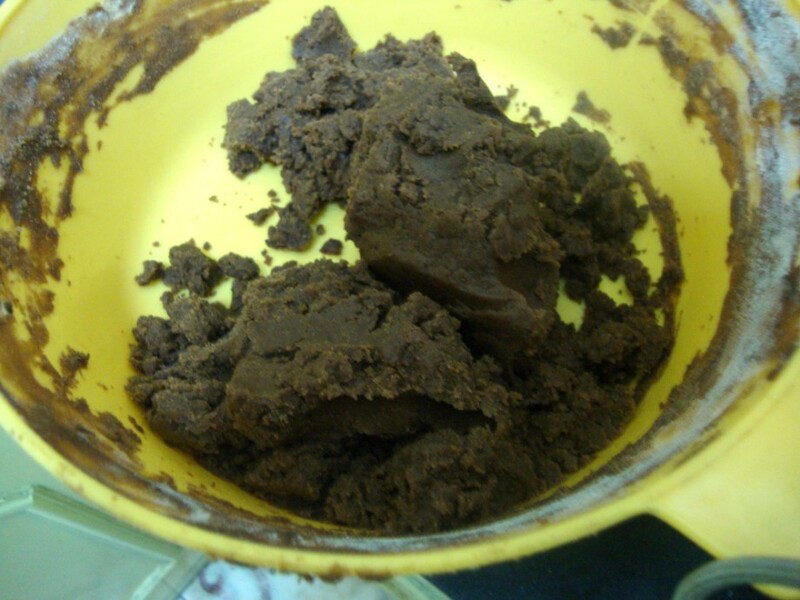 Then slowly mix in the melted vanaspati to the dough. This needs to be done with small quantity and you need to keep rubbing it to get that crumble texture. Finally add the butter and continue kneading the dough. Press the Convection mode in your Microwave, increase the temperature to 185 degree. The time duration for pre heat is taken care automatically by the mw oven. Keep kneading in the dough and continue till you get a dough that is soft yet stays in shape. Make big balls, dust your palm and the board with flour, press out to 1 inch thick sheets. Using the cutter, press on the sheets. Once all the cookies are shaped out, place them on the tray. Grease the tray if required, else you can place as such as the biscuits will let out oil during the baking process. Once you have placed all the biscuits on the tray and the timer on the pre heat goes out, place the tray inside the mw oven and bake for 15 minutes. After 15 minutes, you can let it rest for few minutes inside the oven. Then remove and allow it to cool before storing it in an air tight container. 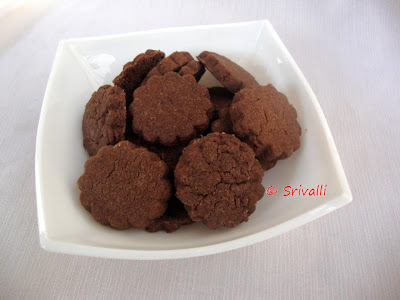 With 2 cups of flour, I got two batches of 40 small sized biscuits. Once the cookies are cooled a bit, transfer them to the wire rack and bake the second batch. These are for my Kid's Delight ~ Chocolate Feast! as I will be doing the round up in couple of days time. So if you still have some entries..do send them. Check out my Blogging Marathon buddies in action! Priya Suresh, Jay, Monika, PJ, Priya Vaasu, Azeema, Reva, Ayeesha, Veena & Soumya.